Jungle Safari in Nepal is a great way to relax discovering the best of viewing the flora and fauna and the original local people and culture along watching wild animals and scenery. Nepal is a country of exceptional biodiversity and a beautiful natural environment. In Nepal, the wide range of the earth’s topography and climate zones are found within its areas of 147,181 square kilometers including a wide range of ecosystem from tropical jungles of the Terai to the arctic conditions of Himalaya highlands. Nepal’s rich bio-diversity renders it ideal eco-tourism destination. The southern plain of Nepal is covered with dense tropical forests which are popular for Jungle safari tours. The forests have teamed with fascinating wildlife and exotic birds. During the Jungle Safari Tour in Nepal, you will discover the ideal situation of viewing the jungle scenery, birds and animals and the indigenous local people, their colorful tradition, unique dress, and languages. You will have a chance to enter the jungle and view some of the rarest and most endangered wildlife on earth. 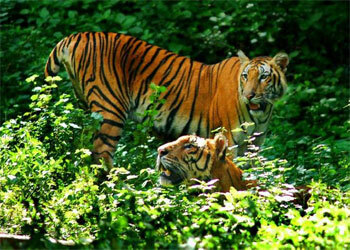 Nepal Wildlife Jungle Safari Tour can be a very exciting experience in jungle activities with your family and friends. The tropical jungles of the Terai preserve some of the best wildlife habitats in the subcontinent. Nepal has sixteen national parks, wildlife reserves, and conservation areas, occupying 16% of its total geographical area. 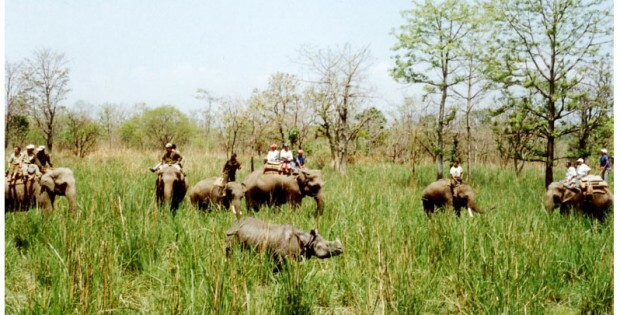 Jungle safari tour on elephant back or Jeep rides are offered at the Parsa Wildlife Reserve, Bardia National Park, Chitwan National Park and the Suklaphanta Wildlife Reserve. Nepal’s most popular National Parks offers excellent jungle safari riding on an elephant or a four-wheel to discover some of Nepal’s unspoiled natural habitats. Nepal Jungle safari tour or expedition consists of canoe rides on the Jungle Rivers, nature walks, birds watching excursions and quick tours around the villages to discover unique culture and traditions of the local village people. There are also scheduled cultural-musical programs performed by the villages with unique culture and traditions. Nepal Jungle Safari is nature walk in the Jungle overlooking the enthralling beauty of Jungle vicinity with many wildlife dwellers. Jungle walks bestow close-up chance to analysis different categories of animals as well observe their track, sign, and sounds. The most enthralling program offered by Nepal not found elsewhere in the world is regarded as jungle safari. The warm subtropical Jungle in Terai region of Nepal houses have animals such as Royal Bengal tigers, rhinos, leopard’s wild elephants, sloth bears, monkeys, crocodiles, and four kinds of deer and over 250 species of exotic birds. For those who wish to experience the natural environment at its best, there is no better place to visit than Jungle Safari in Nepal. We are well experienced in organizing jungle safari and wildlife safari adventure trip for the travelers, as it has in-depth experience relating to the field. Are all safari activities done inside the National Park? 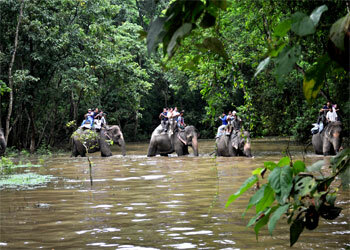 Except Elephant Safari, all other activities are done inside the Chitwan National Park. Elephant Safari is done in Community Forest. What is the driving time from Kathmandu to Chitwan? And Chitwan to Pokhara? Kathmandu to Chitwan is approx 5 hrs and from Chitwan to Pokhara 4-4.5 hrs. Is there a WI-FI in the Lodge? How safe is it to travel by Road? Yes, it is safe to travel by road. We suggest you to take a Private Vehicle which is more safe and convenient for your journey. Do you do Pick-up from Bus Station? Yes, our representative pick-up from Sauraha Bus Station for FREE. Is Chitwan and Sauraha the Same? Chitwan is a district name and Sauraha is the small village where most of the hotel and lodge are located and conduct the safari tour. Is Elephant Bathing Possible Though out a year? Elephant Bathing is only possible during Summer Time. Is Jeep Safari Possible through out a year? Jeep Safari in Chitwan National Park is only possible from 1st week of November till end of June. If you wanted to do the Jeep safari in 20,000 Lake, it is possible throughout a year. We will provide a cottage type A/C accommodation during your Chitwan Jungle Safari trip. What type food can I expect? What is the best time to come for Chitwan Jungle Safari? The best time for this safari is February to Mid June and September to December. What temperature can I expect? Normally Chitwan National park is bit warmer than Kathmandu and Pokhara. But, it will be cold during the month of winter (December, January and February). Is it possible to charge my iPod, digital camera or batteries? Yes it is possible to charge the batteries, we advice to bring your adapters, the plugs might be different here than you are using so donâ€™t forget to check it up on your arrival, you can buy the adaptors easily in Kathmandu, where many stores in the street sell it. Can I buy Local Sim card how about the telephone Calls? You can buy the local Sim card in Kathmandu on your arrival or in Chitwan also, Ncell sime card is easy to get ( you need passport copy and passport size photo), Telephone calls can be made from the hotel that you are staying in also. How much additional money do I need? The water comes in tap or in the room is not recommended for drink. We recommend to use bottled water that is available everywhere. Can I add extra day in the mentioned package in your website? You can add the extra day by paying additional costs to cover guides, accommodation and food, we can arrange a different activities also if you like to add more extra days. Above are the questions we often get from the customer, if you will have more question please feel free to contact us.